Cee-c’s elder sister has again taken to social media to defend her following her recent cat fights with Nina and Alex over food in the house. 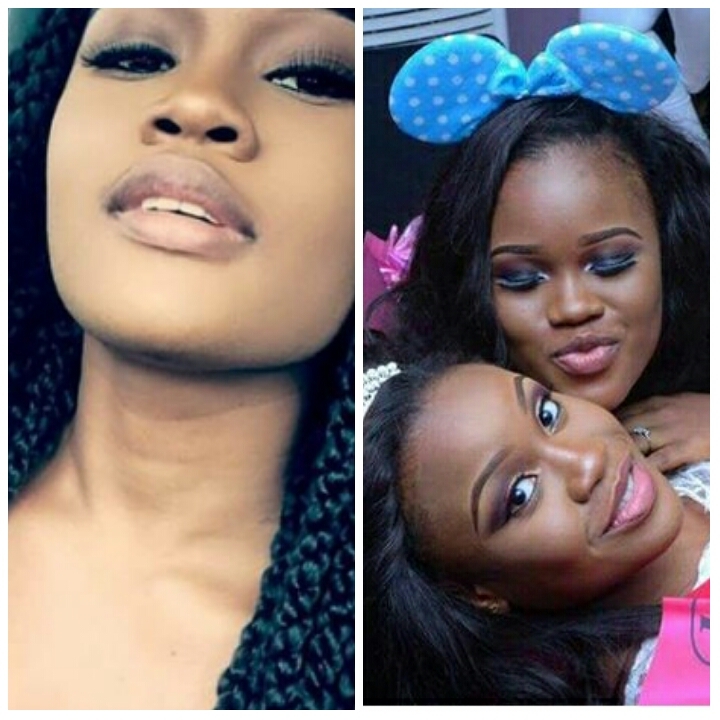 Cee-C who has become quite infamous for her behavior since the reality game show started was described by her elder sister as a sweet young lady which many people don’t agree to and she’s not a bipolar patient or a witch as many people have described her as. 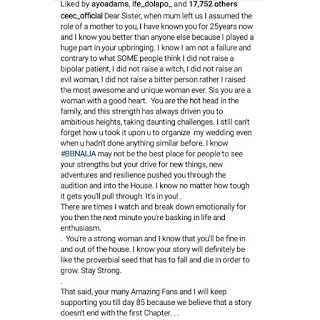 a mother after their mum’s death and despite what most people are saying about Cee-C, she raised the most awesome woman. Dear Sister, when mum left us I assumed the role of a mother to you, I have known you for 25years now and I know you better than anyone else because I played a huge part in your upbringing. I know I am not a failure and contrary to what SOME people think I did not raise a bipolar patient, I did not raise a witch, I did not raise an evil woman, I did not raise a bitter person rather I raised the most awesome and unique woman ever. Sis you are a woman with a good heart. You are the hot head in the family, and this strength has always driven you to ambitious heights, taking daunting challenges. I still can’t forget how u took it upon u to organize my wedding even when u hadn’t done anything similar before. 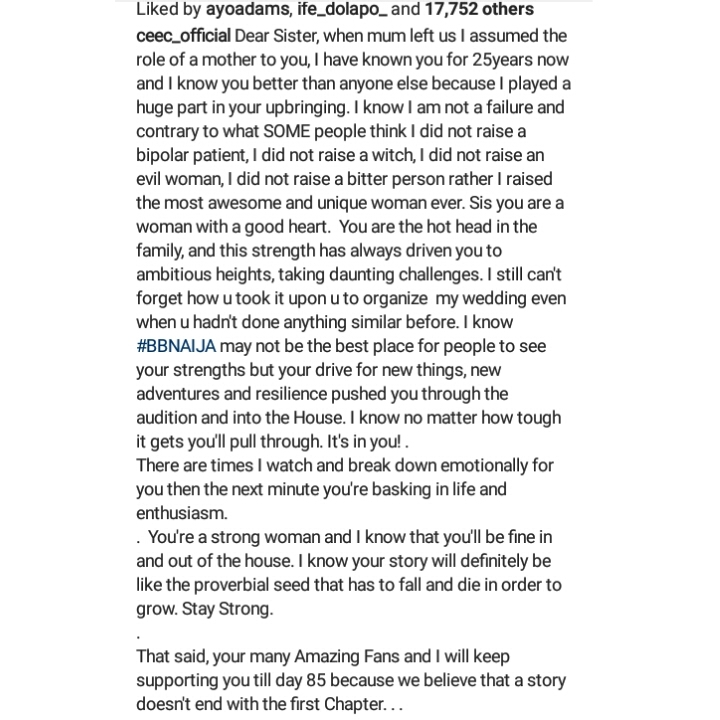 I know #BBNAIJA may not be the best place for people to see your strengths but your drive for new things, new adventures and resilience pushed you through the audition and into the House. I know no matter how tough it gets you’ll pull through. It’s in you! . There are times I watch and break down emotionally for you then the next minute you’re basking in life and enthusiasm.
. You’re a strong woman and I know that you’ll be fine in and out of the house. I know your story will definitely be like the proverbial seed that has to fall and die in order to grow. Stay Strong. That said, your many Amazing Fans and I will keep supporting you till day 85 because we believe that a story doesn’t end with the first Chapter. . .